Welcome to Hotel Casa Karina Bansko! 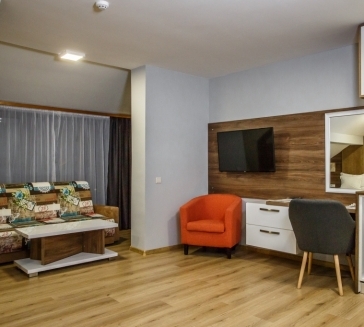 Hotel Casa Karina Bansko is situated at the foot of the Pirin Mountain, in one of the most beautiful and modern Bulgarian ski resorts – Bansko. For the comfort of it’s guests the hotel stays only 100 meters from the home station of the gondola and 20 minutes walk from the picturesque center of the city of Bansko. Our team will comply with your free time and will make your vacation more enjoyable and memorable. To this end, we offer a wide range of additional services – excursions, picnics, biking, horseback riding, hiking and more. For our business clients the Hotel offers excellent conditions for all types of company events such as team buildings, seminars, conferences, trainings and etc. Forget the daily stress and come to a vacation in the beautiful Pirin Mountain!